Eggs feature in a wide range of famous national dishes. They are cheap, nutritious and lend themselves easily to a wide variety of dishes. 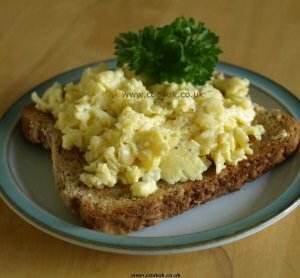 Scrambled eggs and hot smoked salmon make a delicious combination in the recipe submitted by a CookUK reader. Re-live a recipe from your childhood! Eggy bread makes sense every way possible. A delight for the taste buds, nutritious and extremely cheap. You won't be disappointed with this 12 minute recipe. 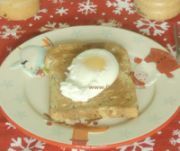 Perfect poached eggs can be yours every time with our simple cooking technique. Pictures and a detailed video show exactly how to cook poached eggs. Delicious on it's own as a snack or with a main meal. We show you how to cook egg fried rice with a video and lots of pictures. A frittata is the Italian version of an omelette. Ours is filled with sliced potatoes and vegetables. Cook it very slow then crumble cheese on top and place under the grill. Tasty it definitely is! A full meal in less than ten minutes, what can be faster than that! And they are very tasty as well. A simple but traditional Spanish dish. A slow cooked thick omelette with potato, onion and maybe a vegetable. Simple to make but delicious to eat. We give you two more frittata recipes on one page. An asparagus and feta cheese version together with a bacon, mushroom and sweet pepper version. We show you how to make the perfect omelette. We used cheese and herb fillings but there are hundreds of others making the humble omelette never a boring dish. Hard boiled eggs on sliced sweet pepper with a mayonnaise sauce. Simple and quick to make, this is a great starter. A great delicacy when cooked well, a constant disappointment when cooked badly. 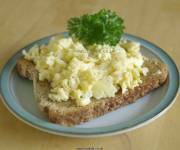 We spent much time and effort to come up with the perfect scrambled eggs recipe. 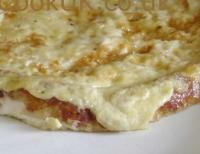 An ultra quick omelette recipe submitted by one of Cookuk's readers. Ready in under 9 minutes and exceptionally tasty. This is the way to start off your day!